I'm not the kind of person to make controversial statements. So, I unfortunately have to go the way of being a cool and "with it" film reviewer when I say that Quentin Tarantino is a genius. Not just any old genius, but a certifiably crazy genius, because only a nutcase with a keen creative intellect could have made Reservoir Dogs. We open on a diner. Eight men are sitting around, telling stories and making jokes like old friends. One of them (Quentin Tarantino) is regaling his comrades with a rant on why "Like a Virgin" is about a girl who likes her men big where it counts...exactly the kind of pop culture shenanigans we pull with our friends everyday (but perhaps not to such an intense degree). All in all, a rather enjoyable breakfast amongst buddies, right? If only you knew what Tarantino had in store. After the credits, we open on one of the men, Mr. Orange (Tim Roth), in the backseat of a car, bleeding to death out of a gutshot. Mr. White (Harvey Keitel) is driving frantically, trying to console Orange. Apparently, six of the men at that diner were just getting a cup 'o joe before pulling off a diamond heist for the other two. Things went very wrong, though, as these things tend to do, and the survivors, including Orange, White, Mr. Pink (Steve Buscemi), and Mr. Blonde (Michael Madsen) pull themselves to the rendezvous point to puzzle out what exactly happened. It quickly becomes apparent that somebody's a rat - but who? It's rare that a genius writer is also a genius director (just see Kevin Smith for proof of that). However, Tarantino has both glittering brilliantly in this, his first film. The dissertations and anecdotes are keenly honed, as is his character development (mostly through flashbacks) and dialouge. The lens captures what he writes perfectly, including some shots that will probably still hold resonance 20 years from now (particularly Keitel and Buscemi's brief altercation and the infamous four-way faceoff). Tarantino also knows how to use his actors. I really hate the school of film thought that says actors must be nothing more than props in front of the director's lens. While Hitchcock managed it just fine, Kubrick always made his films seem a little...distant (not to say he isn't a genius. He is, but can still have my caveats). Tarantino is an actor himself, so he presents both an image and an emotion (from the camera and the cast, respectively). Keitel is good as usual, playing perhaps the most sympathetic character is this parade of hoods. He's able to be paternal to Orange while still playing the badass when necessary. Roth, whose work I have always enjoyed (the Planet of the Apes remake excepted), has to do most of his work here simulating incredible pain. He plays aggravated absolutely fabulously...it's one of his strengths. However, when his character is more lucid (during flashbacks), Roth's British accent keeps on threatening to pop through. The rest of the ensemble do good work also. There wasn't a really weak performance in the bunch (although Chris Penn had a slight tendency to overact). Tarantino proved himself to be a force to be reckoned with after this feature. Its supremely acted, crisply paced, and entertaining as hell. 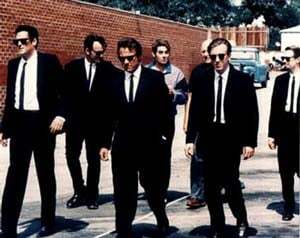 Though Reservoir Dogs is a hard film to top, the director's sophomore effort, Pulp Fiction, would prove to be better by a hundredfold (it's in my top 10 of all time). 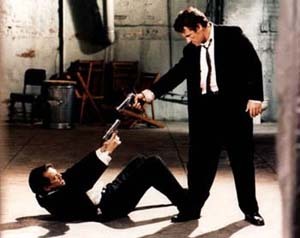 But for some truly inspired filmmaking, see Reservoir Dogs. DVD Notes: Well, the bad news first - the colors on Artisan's 10th Anniversary disc look terrible. Apparently, giving the blacks definition and depth never occured to the good people doing the transfer. As a result, the visuals look awfully muddy. Otherwise, though, the Dolby 5.1 soundtrack is magnificent, very clear and clean. I didn't have time to go through all of the extras, but I did watch many of the cast interviews. Michael Madsen does his at home with his kids...and he's very much like his character, very laidback. Tim Roth is interviewed poolside with the, get this, Reservoir Dogs Synchronized Swimmers. Quentin Tarantino's is the real treat, though. He doesn't add any fresh information - most of it is stuff you can find on the Internet Movie Database - but his sheer filmgeek enthusiasm for the project and its inspirations is infectious.